Quick update… after firmware patch. So, the first 90% charge after the firmware of the Model S at 29,000 miles was updated from V6.0 (1.67.125) to V6.0 (2.0.81) and I was able to remotely verify that it was still holding at 226 miles for that charge. This is only a few days after the 29,000 Mile post (also, mileage is now 29,460). 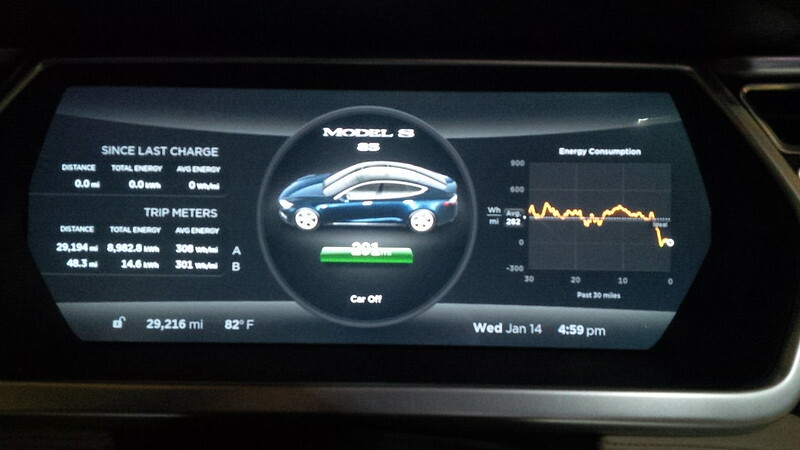 Posted on January 17, 2015 January 17, 2015 Categories Battery Degradation, in for Service, Tesla Model STags 29000, 29000 Miles, Battery Degradation, Significant Mileage, Tesla, Tesla Model S, Tesla Motors1 Comment on Quick update… after firmware patch. 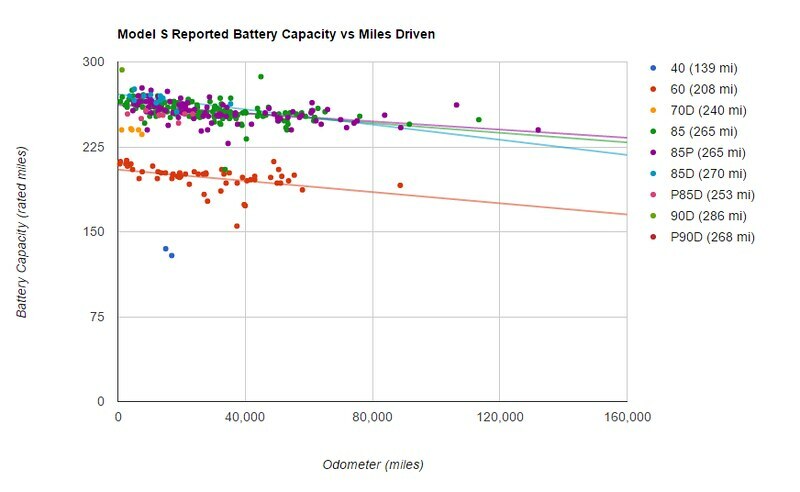 We’re getting to the point where we’re close to “doubling up” on the miles on the Model S than our Roadster. 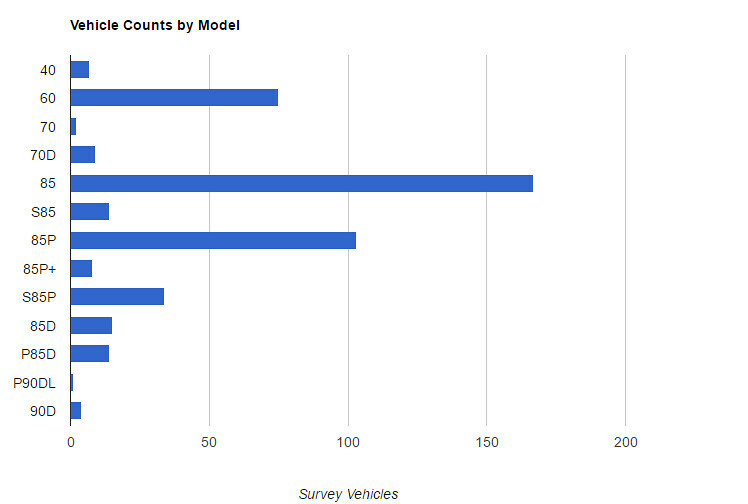 It’s got a lot more to do with the utility of a Model S vs. a Roadster as well as the number of miles that I drive for work. The Model S is a 2013 that we picked up in November 2013 and the Roadster is a CPO that we picked up in September 2013. 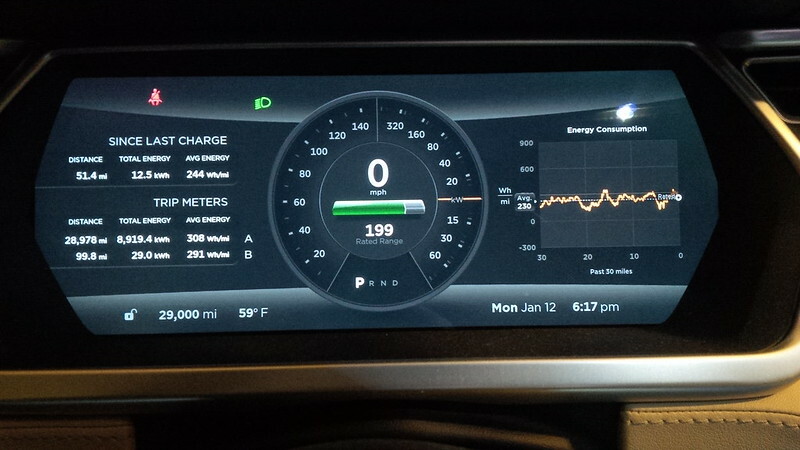 The Model S had around 20 miles when we picked it up and the Roadster had around 2200 miles when we picked that up. They’re both great cars in their own rights and we’ve put in close to 15,000 miles on the Roadster at this point. The battery degradation on the car has shown its effect in the last few hundred miles. My 90% daily charge has gone down to around 226 Rated miles/261 Ideal Miles. 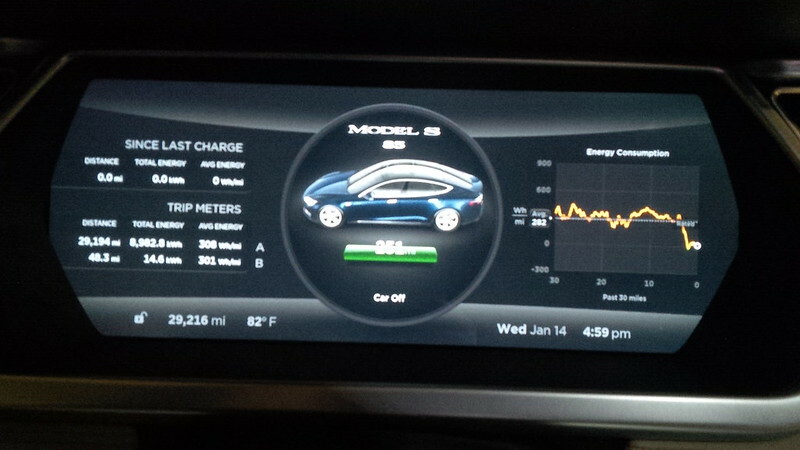 Range charges in my most recent charge is 251 Rated miles/291 Ideal Miles. Most parts of the world, winter has a very noticeable effect on range. This is not normally the case in Southern California. With 291 Ideal miles or 9 lost miles. Doesn’t look bad vs 300 miles. But I live in a rated miles world and my 265 is now down to 252, so that sorta hurts, after all 13/265 is almost 5% of usable range gone vs. the Ideal loss around 3% (291/300) though this is also 4.6% (291/306). I often charge the car to 90% on most days. The Roadster has a feature called “Top Off” that I mimic on the Model S. What that means is before I roll off, I extend the charge and run the pre-conditioning to cool the car and battery down. I wonder if that contributed to the degradation. Either way, there it is. Still waiting on Tesla to step it up and provide some sort of warranty and guidelines on what to expect. 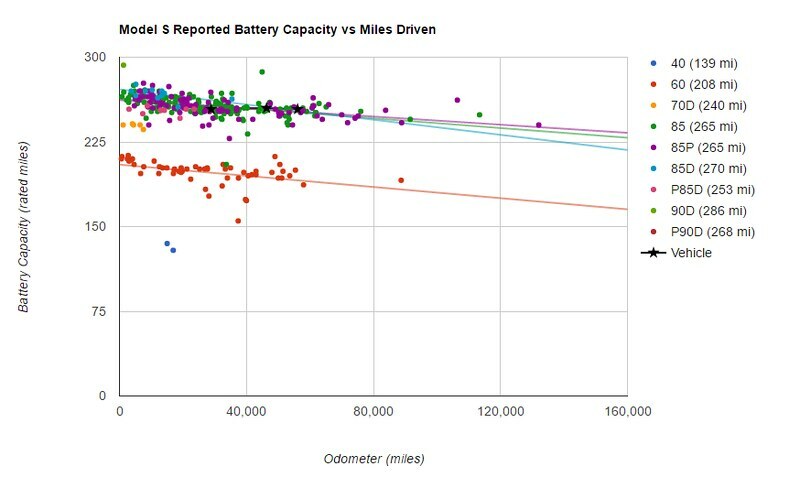 If battery loss is linear, then should I expect 20% loss by 116,000 miles? Or is loss on a curve and 20% is closer to 150,000 or even 200,000 miles? Or is it accelerated and 5% loss is actually good for 29,000 miles. Not to mention the fact that I am measuring this based on Rated miles, which is what really works, but should I continue to normalize and look at Ideal miles, which may be ideal, but unrealistic. Because, as I’ve written, that’s currently closer to a 3-4.5% loss of Ideal miles. Perhaps I should charge the car less and let it dip below 100 miles more often. Some guidelines from Tesla really would help here. In the meantime, we’re saving for replacement battery packs for the Roadster and Model S. Even without some sort of guidelines on what that will cost, the recent 400 mile Roadster upgrade announcement makes me hopeful that the same, or at least a replacement pack price will be announced for the Model S when our pack drops down to a level where either something kicks in to replace it or it gets unbearable and we decide to replace it ourselves. Tesla Gigafactory anyone? As I’ve mentioned before, c’mon Tesla be AWESOME again! 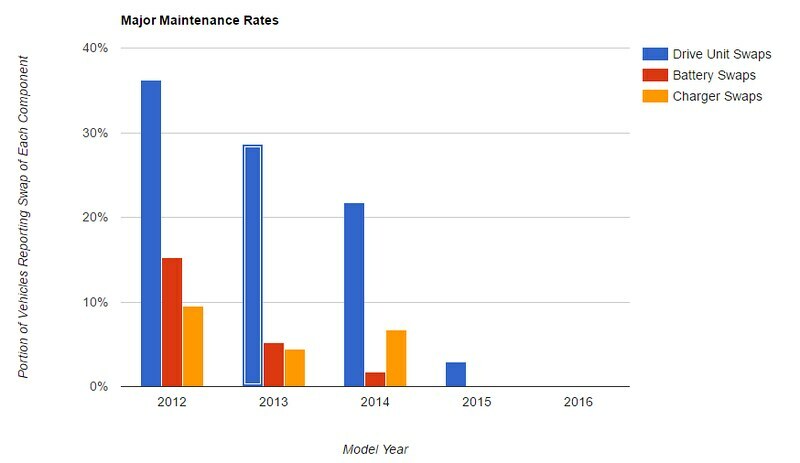 Publish a Battery Degradation Warranty that we can count on or at least start to provide pricing on replacement Model S packs for folks to start saving up for. I’ve been asked several times on social media as to the firmware at the time of the publication of this post. Now updated to v6.0 (2.0.81) at the Service Center.